9 When they got out on land, they saw a charcoal fire in place, with fish laid out on it, and bread. 10 Jesus said to them, “Bring some of the fish that you have just caught.” 11 So Simon Peter went aboard and hauled the net ashore, full of large fish, 153 of them. And although there were so many, the net was not torn. 12 Jesus said to them, “Come and have breakfast.” Now none of the disciples dared ask him, “Who are you?” They knew it was the Lord. 13 Jesus came and took the bread and gave it to them, and so with the fish. 14 This was now the third time that Jesus was revealed to the disciples after he was raised from the dead. 15 When they had finished breakfast, Jesus said to Simon Peter, “Simon, son of John, do you love me more than these?” He said to him, “Yes, Lord; you know that I love you.” He said to him, “Feed my lambs.” 16 He said to him a second time, “Simon, son of John, do you love me?” He said to him, “Yes, Lord; you know that I love you.” He said to him, “Tend my sheep.” 17 He said to him the third time, “Simon, son of John, do you love me?” Peter was grieved because he said to him the third time, “Do you love me?” and he said to him, “Lord, you know everything; you know that I love you.” Jesus said to him, “Feed my sheep. One of the more meaningful experiences for me this year was our recent trip to Austin, TX. While in Austin, Caleb, Lucas, and I stayed at a place called the Community First Village. Erika and I had the opportunity to visit Community First last year and it was unlike anything I had seen before. 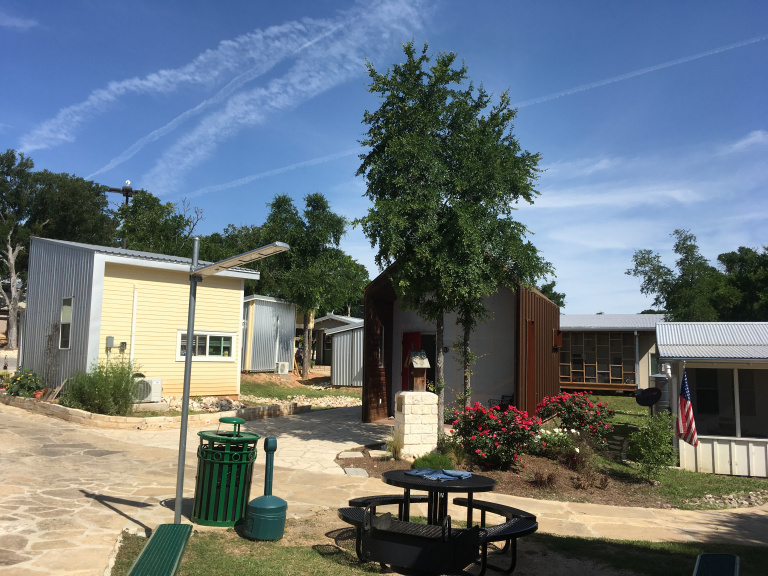 Community First is a 27 acre village that provides affordable, permanent housing and a supportive community for the chronically houseless in central Texas. Before this past September I would have said “chronically homeless”. But this past September our friend Jared from LIVING Ministries came and shared a bit about their work with the houseless, highlighting the fact that we all have a deep longing for home, and in a sense we are all homeless. Our brothers and sisters on the street are no more homeless than you or I, but they are houseless. Back to Texas. At Community First you walk through this village of 27 acres. And the village is composes of hundreds of tiny houses, RVs and teepees. There’s a garden. And goats. And chickens. And a wood shop. And a blacksmith shop. And more that 200 chronically houseless children of God have found a community and sense of belonging there. And its an inspiring place. An amazing place. A beautiful place. Alan Graham, one of the founders of Community First calls this place a part of the Gospel con Carne. The Gospel con carne. Does anyone here know what “con carne” means? With meat! The Gospel with meat?? In the passage from John we see the physical Lord eating breakfast with his friends. As they sit around the fire, Jesus seeks out Peter. This same Peter who denied Jesus three times is challenged three times to feed and care for Jesus’ flock. His Sheep. But what should he feed them? The author of the book of Hebrews also had food on his or her mind. The book’s target audience seems to have forgotten just who Jesus is. So the author goes to great lengths to run through all of the Old Testament prophesies that Jesus fulfilled. He is the promised Messiah. Just not the kind of Messiah everyone was looking for… In Eugene Peterson’s Message we see the author of Hebrews getting a little frustrated with his audience. Now I’m not a Biblical scholar. At Grove City I majored in bike riding with a minor in Quaker Steak and Lube Chicken wings. But I believe the author of Hebrews is doing whatever the first century equivalent of a face palm would be. The Gospel con carne. The Gospel with some meat on it. Alan Graham says that the Gospel con carne is the gospel of flesh and meat of a reality that’s gritty, and truthful, and of being embodied in flesh given a human form. The gospel con carne is about becoming fully human. The believer in Christ is called to grow in order to be able to process and be nourished by solid food… the gospel con carne. The aim is to become well acquainted with the person and perfect work of Jesus Christ. Caleb, Lucas. Have you become well acquainted with the person and perfect work of Jesus Christ? Did you see Him revealed in Scripture and the breaking of bread? Did you meet Him at Light of Life? Did you see Him in the mountains of Thailand? Did you feel Him in the embrace of the churches we visited? Then, its time fore you to feed His sheep!! And God wants you to bring His sheep a hearty meal that will truly satisfy. He doesn’t want us to bring His sheep a watered down Gospel or meal. Go back to that beach with Jesus. He hasn’t made his friends a continental breakfast. This isn’t a bowl of Fruit Loops. This is a breakfast that will fill them up. This is the Gospel con carne. “The low temperature on the East coast will be colder than the high temperature on Mars this weekend,” Nate shared while driving with our fellows to run some errands before our departure to Thailand the next day. We’d finished the first portion of Agape Year, engaging with local ministries and churches in Pittsburgh and been preparing for our time overseas with the Anglican Church in Chiang Mai, Thailand. We’d gone through thoughtful and meaningful prep and prayer with New Wineskins. We’d had a great time delving into cross cultural and ministry training with SAMS. Our bags were packs. Visas acquired. We were ready. And, then 5,000 flights were cancelled out of JFK airport due to a weather phenomenon called a “bomb cyclone”. Nate spent most of the day before our departure on the phone trying to get us rebooked on a different flight. We had success in rebooking our flights through our travel agency and while our travel time increased by 20 hours (yikes when travelling with small children), we were grateful to not be stranded at the airport. After an early morning departure from Pittsburgh, we made it to JFK airport and settled in at our gate for our connection to China and then onto Chiang Mai. When the airline representative appeared at our gate, we went to check in. As she looked at our passports, she informed us we wouldn’t be able to fly today. Shocked, I asked why and what could be done. Because of being re-booked with two layovers within China, we needed Chinese visas, something we did not have and did not anticipate. “Go talk to the ticketing desk outside of the departure gates” she said. We grabbed our belongings, our sleeping toddler, and booked it to the airlines desk. We were met by a sea of chaos of travellers who’s flights had been cancelled. It was a mess. As we approached the ticket counter, there was woman standing on it, shouting “Everyone needs to be in a line. This line for rebooking. That line for questions.” We definitely had a question. As we explained our situation, puzzlement filled the attendants face. She conversed with her superior and co workers. More confusion at our predicament. After much conversation, the airline said it was a rebooking error by our travel agency and they can do nothing for us. Our hearts sank. We would not be leaving JFK today. Then, Nate’s phone dinged with a message from our missionary hosts. Gerry had been hospitalized with dengue fever. We returned to our fellows to share the situation. “Text your prayer team. We need prayer,” we instructed. Caleb and Lucas jumped on it and we had most of the Eastern Seaboard praying for Agape Year and the team at St. Andrew’s in Thailand. We set up camp near the chapel rooms in JFK. There was a sea of stranded passengers from around the world sleeping on the floor, aimlessly walking airport aisles, and bombarding the two restaurants available in the Terminal. At one point, after about 8 hours of being on hold with our travel agency, we saw a mission team move in for the night close by. They too had had their travel plans disrupted by the weather. They gathered to pray. As they prayed, an airline representative came to tell them they had rebooked them on a flight and now had tickets. Shouts of “Praise the Lord! !” and “God is good! !” filled the stale airport air. And, they eagerly rushed towards us offering the blankets they’d been given by their airline and asking to pray with us and those passengers camped out around us. We were grateful for the blankets (and the prayers), but struggled to see how God was answering our pleas we’d been uttering all day. The airport was chilly, the floors were hard, and we didn’t know how it was all going to turn out. And, then trickles of God’s presence showed up. At the last minute, Lucas had packed a power strip. Plugged into one of the only outlets in our area, it provided a ‘watering hole’ for international travellers whose phones’ batteries needed to be charged. We swapped stories with people from Columbia, India, Taiwan, Israel, Nevada, France, etc. Our hearts were filled with compassion for each person’s unique story and God’s love for them. My brother in law offered to come pick us up (a 7 hour drive from Pittsburgh), but didn’t have a vehicle that could carry us. Then, our friends offered their 15 passenger van to him, no questions asked. He showed up the next morning with a boat load of snacks and beverages. After a ton of discouraging conversations and time on hold, at 2 AM Nate talked to Christy from our travel agency who was able to ensure us that we would be able to rebooked or refunded due to the error they had made. We arrived back to Pittsburgh and had our church family drop off meals and groceries within hours. Chili and cornbread have never tasted so good J. After a few days, we were able to rebook flights thanks to the assistance of our sending agency. We grew in our affection and connection to our missionary hosts, the Gan family, as we prayed for Gerry’s healing. He was released from the hospital a few days before our second departure. In the face of opposition and disappointment, God showed His agape love for us. He answered prayer. He was present. As we follow Christ and ask our lives to offered as living sacrifices, the path is full of what we perceive as disruptions. 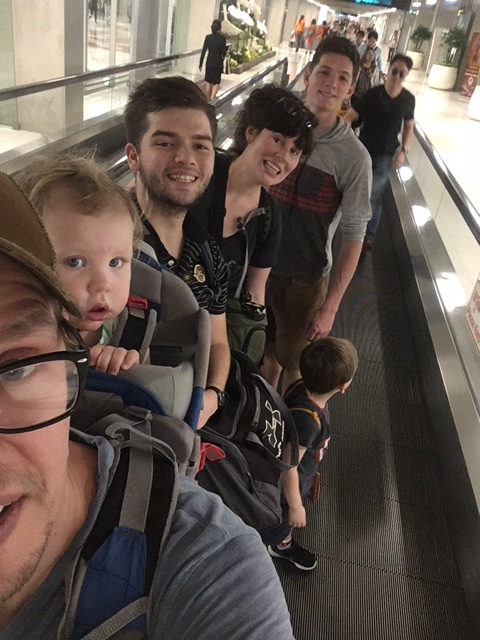 We were on our way to serve God overseas to share His love with the Thai, but turned out God wanted us to trust Him along the way and see His extravagant love for us. Oh, and we made it to Thailand. But that’s another story. “You want to grab dinner?” I asked one of our fellows after teaching his first ESL class at the Community Learning Center at St. Andrew’s in Chiang Mai, Thailand. “I want to die,” he replied with a grimace in his face. “The class was that bad?” Silence followed. We walked to meet Nate and the kids at a neighborhood outdoor dinner joint and debriefed the class. As part of the ministry at St. Andrew’s, both fellows would be teaching an ESL class twice a week to middle school and secondary students. The fellows had enjoyed helping in an ESL class at our home church, but being the lead teacher in the classroom was a different story! We had prepped before and talked through the lesson plan, but the reality of 15 Thai faces in his classroom staring blankly back at our fellow was hitting hard. As we debriefed that night and the following morning, it was clear that this challenging experience was stirring up questions of identity and security for both our fellows. One fellow was sick to his stomach. He felt like his ‘failure’ of teaching the class brought into question his purpose for being in Thailand and ultimately his value as well. Over a plate of fried rice and thai omelette, I said “Even if you failed, that doesn’t make you a failure. You are His. You are a baptized child of God.” There were the beginning of tears in his eyes. For this young man who prided himself in his performance, in being able to serve out of strength, the confrontation of his own weakness had made him encounter the Gospel in a new way. And, it was uncomfortable for him. We returned from Thailand a week ago and while in the throes of jet lag we’ve remembered moments of growth we got to witness in our fellows. We give thanks for the Thai brothers and sisters who we now know by name and story. We are overwhelmed by God’s providence in providing a partnership with St. Andrew’s Centre, connected to the Diocese of Singapore, which is mutually beneficial for Agape Year and their ministry. And, it was a pretty great context for our family (complete with an English preschool for Henry to attend and a family with daughters who became good pals). Thank you for being a part of God’s kingdom come and covering us in prayer. Continue to pray for our fellows as they stay on in Thailand till February 27. They are currently visiting a sister church isolated high in the mountains surrounding Chiang Mai. Please uphold us in prayer for the last few months of Agape Year 1.0 as we travel the US, visiting churches to tell the story of what we have seen God doing in Pittsburgh, Thailand, and beyond. A blessed Advent to you. As we inhabit this intentional season of waiting and anticipation for Christ’s coming, we invite you to rest in the waiting and to see this time as where God is at work. Let’s not hurry to Christmas. Let’s not miss what He has for us along the way. You’ve journeyed with our family in our call to Agape Year for a while. You’ve waited with us to see Agape Year come to be in flesh and blood. You’ve prayed, encouraged, and offered hope while the ‘waiting’ seemed so long. Since the inception of Agape Year, our family has spent many hours traveling, in flux, inhabiting the in between. We’ve been eager to get to the destination: Agape Year’s first cohort. And, we hurried our way there. Then, Caleb and Lucas, our first fellows, came and started to inhabit the plans and prayers that came before them. But, we still felt this hurried drive toward the ‘destination’ of transformational discipleship. As we shared life with Caleb and Lucas, it was easy to rush to a service project then rush home to study together and then rush to prayer. Nate spent much time with our fellows in our faithful Subaru and I was side by side with them in the kitchen multiple times a day. These, along with others, were our ‘in between’ times. On the way to community group or ESL tutoring, Nate’s been able to have frank conversations, listen intently, and pray with our fellows. While washing dishes or prepping meals, I’ve heard our fellows share their hopes and fears for the future, chatting theology, and learned much about rugby and robotic battles. And, in these ‘in between’ times, we’ve been surprised by the Spirit’s movement, reminding us that the ordinary is indeed sacred. We are continuing to tweak and shape the curriculum and formation of Agape Year to meet its goals. But, as we do that, it is easy to lose sight of how discipleship happens along the way, in between the books, projects, seminars, and service. In the gospels, Jesus stops to heal the bleeding woman while on his way to raise a girl from the dead. Jesus shares the words of Life with the Samaritan woman at the well on his way to Jerusalem. Jesus heals a servant’s ear on the way to the Cross. These examples, along with others, remind us that to be His disciple we must allow Him inhabit all places of our lives, even those stray, throw away moments of the day where we are waiting for the next thing. This Advent, while we wait and groan for His coming, we pray that you’ll be surprised by His peace and joy in the ‘in between’. We are also living in an in between spot financially. We’ve grown in our partners and support as Agape Year has started. We are still praying for God to provide monthly partners as we are currently at 50% of our need to be sustainable for years to come. Would you join us along the way? Would you consider a year end gift to help close this gap? Please also join us in prayer as we seek partnership with churches. We hope to have three churches join Agape Year’s vision by financially supporting our family.